A 45-year old man with a long history of heavy alcohol use presented to an out-patient clinic with dyspepsia. He had no history of jaundice, gastrointestinal bleeding or ascites. On examination, firm hepatomegaly was palpable two fingers below the costal margin. The patient’s nails had multiple, narrow and parallel, white transverse bands separated by normal pink nail (Figure 1). The bands were not raised and disappeared on blanching, suggesting origin in the nail bed and a normal nail plate. We also noticed pronounced clubbing. 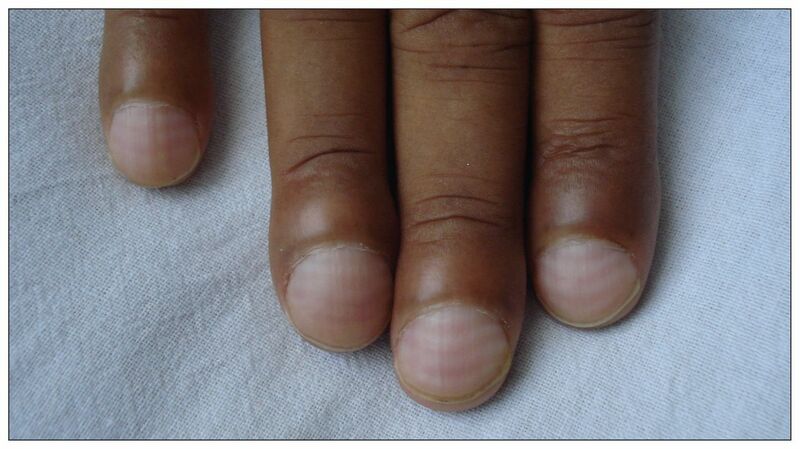 Fingernails of a 45-year-old man with chronic hypoalbuminemia related to cirrhosis, showing multiple narrow, parallel, white transverse bands that disappeared on blanching. The bands were nonpalpable and separated by normal pink nail, suggestive of Muehrcke lines. Clubbing is also visible. Laboratory investigations showed that the patient’s blood was nonreactive for viral markers (hepatitis B surface antigen, antibodies to hepatitis C virus). The patient’s serum albumin was 27 (normal 36–50) g/L. Abdominal ultrasonography showed hepatic nodularity and splenomegaly, and upper gastrointestinal endoscopy showed small varices. We diagnosed alcohol-related cirrhosis and portal hypertension.
. The finger-nails in chronic hypoalbuminaemia: a new physical sign. BMJ 1956;1:1327–8.
. Mees lines and Beau lines after chemotherapy. CMAJ 2010;182:E149.
. Muehrcke’s lines. Am J Med 2010;123:991–2.
. Clubbing: an update on diagnosis, differential diagnosis, pathophysiology, and clinical relevance. J Am Acad Dermatol 2005;52:1020–8.